Leading the industry in thatch sales to resorts, zoo's, theme parks, restaurants, hotels, movie companies, and now available online. Learn how to build a tiki hut, tiki bar and how to thatch. All trademarks, logos & copyrights are the property of their respective owners. Tiki thatch roof materials are often made out of Mexican palm leaves and are tightly woven or braided on one side, while the opposing side is lightly ridged and fringed, thus ensuring durability, as well as easy manipulation and installation. In addition to this, Tiki Thatch roofing material is generally both light weight, as well as durable, holding up against the elements of the world with ease and offering an absolutely beautiful addition to any backyard retreat. Tiki thatch roofing material is also sold primarily to zoos, theme parks and resorts nationwide, each buyer recognizing the quality of the material and the ability it lends to transport those it surrounds to a world of relaxation and island style life, thus making it an ideal purchase for themed destinations. This is also why homeowners will love this commercial grade material when creating the ultimate backyard tropical escape. In addition, tiki thatch roofing material is also very affordable. We offer fast and free nationwide shipping so you can get one step closer to that backyard resort vacation you have been looking for. Tiki Thatch roofing includes palm roofing, African thatch, Tahitian thatch and artificial thatch and is a great option for those looking to add a little life to a garden bungalow, create an attraction of their own, or even add some pizazz to a child’s play house. Tiki thatch roofing material can be used in a wide array of projects and activities. The various different types of buildings/structures this tiki thatch material can cover are close to endless. Tiki thatch roofing material is most commonly used in places like zoos, theme parks and resorts, to give many of the builds, shacks and cabanas an imported island style vibe that is hard for those looking for a break from everyday life to say no to. However, tiki thatch roofing material can also be used to transform a person’s own backyard, or even in home bar or office, to a tropical get away or retreat. Simply add a few layers of the tiki thatch roofing material to any area to experience your home-away-from-home. Tiki thatch roofing material is very echo friendly. Being produced by entirely renewable resources, such as various species of palm leaves, reeds and more, the Tiki Thatch Roofing Material market is one in which the environment is protected. Authentic tiki thatch roofing material that is sold here at Sunset Bamboo is 100% eco-friendly. This is a great option for those looking to turn their backyard into their own private oasis while keeping true to the environment. There are several options for style in regards to tiki thatch roofing material, each one offering a slightly unique feel and look over the others. 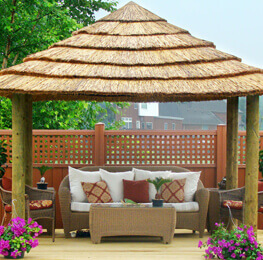 So, in deciding what sort of tiki roofing you need, just take a look at our options. The three main style options are: The Palm Island Thatch roof option, the Tahitian Thatch roof option or the African Reed Thatch roof option. 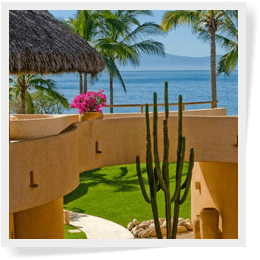 The Palm Island Thatch Option - The Palm Island Thatch option is made from Mexican Palm leaves. The Palm Island Thatch option is also great for use in both indoor and outdoor settings, offering an affordable and aesthetically attractive solution to all your tiki thatch roofing needs. With that said, the Palm Island Thatch option is one which appears to be a more laid back, “shaggy” sort of look, the palm leaves appearing relaxed and at ease — yet still stable and ordered —atop the structure upon which they reside. 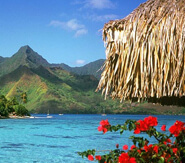 The Tahitian Thatch Option - The Tahitian Thatch option is one which is brought about via tightly woven palm leaves, which are then bound together by nylon. This option — appearing with shorter, more uniform looking palms when finished and retaining a darker, almost charcoal color — is one which really suits a more modern and upscale type of decorative style. 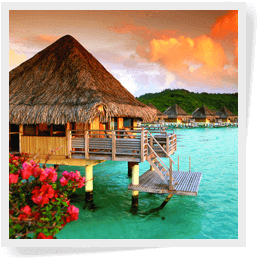 In addition, the Tahitian Thatch option is actually used by Palapa builders to create the roofing for both various resorts and residential buildings, proving that this option is one of the most durable tiki thatch roofing material options to date. The African Reed Thatch Option - The African Reed Thatch option is one that is made entirely out of cape reed and is one of the most durable options. 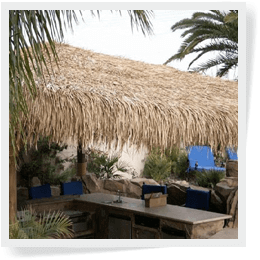 Maintaining a very orderly and uniform appearance upon completion, this toffee colored thatch is great for any island booth or cabana that plans to remain standing throughout all the various elements and climate conditions for years to come. A real consideration for anyone looking to add a thatched roof to a commercial building!